What is the difference between a Heron & a Crane? Crane or Heron...if it's a Henry Dupere rusted metal Garden Sculpture, it's a Heron. The main difference between a heron & a crane can be seen in structure & behavior. The heron has a coiled neck & straight dagger-like bills. The crane has a shorter bill & their neck is minus the spring-like crook. The crane is very different in comparison to the reserved heron. The most widespread & frequently seen heron is the Great Blue Heron. They usually migrate in in small flocks but are most commonly seen singly wading at a stream or ponds edge, along coastlines, or fields & meadows foraging for food. Cranes tend to fly in flocks foraging for food. The most famous of cranes, the whooping crane, is actually rather rare with only about 200 existing in the wild! A more common crane, the Sandhill Crane is often mistaken for the Great Blue Heron. The heron is a graceful, statuesque, regal looking bird! The heron can cruise at some 20 to 30 miles an hour. Cranes perform a large, elaborate dance during courtship that is not done by any other species. 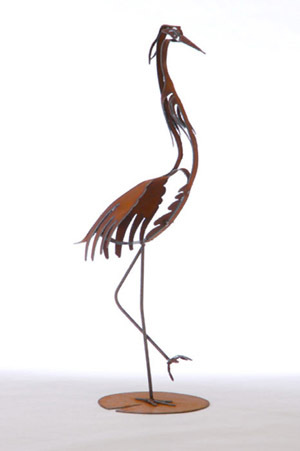 Along with the turtle, the heron is the newest addition to the Henry Dupere rusted metal garden sculpture collection!!! Henry Dupere Heron/Crane Garden Sculpture. 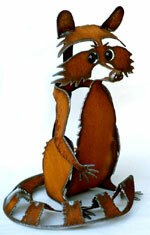 Size: 34" tall by 19" wide.